These coconuts are harvested before full maturity, and come full of sweet water inside which is delicious and refreshing to drink straight from the coconut using a straw. Each coconut is trimmed to look like a little house (they're round and green when harvested), then shrink-wrapped in plastic to maintain freshness in shipping. Along the walls of the coconut is a sweet white meat. 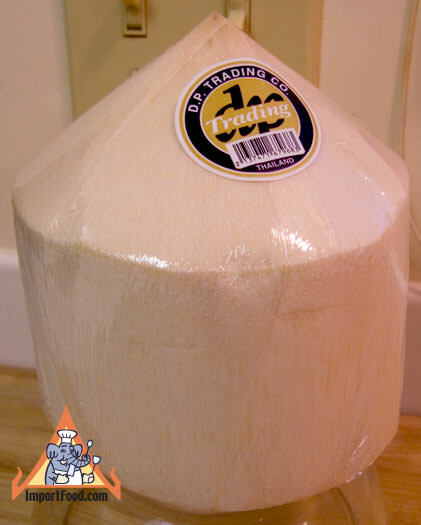 Each coconut has approximately 1 cup of water and 1/2 cup of meat. We're featuring fresh young coconut in our recipe for coconut cream pie. There are several other ways to enjoy it. In Thailand it's common to see street vendors selling young coconuts. They crack it open in front of you with a cleaver (they are easily opened by whacking around the top), and insert a straw. A fresh drink on the sidewalk. It's also common for people in Thailand to take one home, crack it open, drain the water into a glass, then scrape out the meat and add that to the same glass. This is then put into the freezer, to be enjoyed later as a healthy chilled beverage. Fresh coconuts are often used in restaurants as a serving vessel. 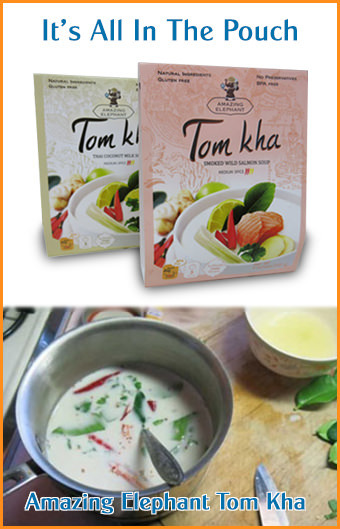 A common Thai recipe served in fresh young coconut is hor mok (fish custard). Another use for the meat is to add it to green curry. You can also stir-fry the meat and add it to red curry. Cook and/or serve your favorite Thai fried rice, seafood, or anything else in the coconut. Young coconut juice is also known for hormone balancing properties and is a recommended part of a daily diet among post-menopausal women, and in Thailand the water is used as a component in dietary supplements.